I have two Launchpads Mini which I am using with my tools (e.g. Step Sequencer and Live Dive, see signature). 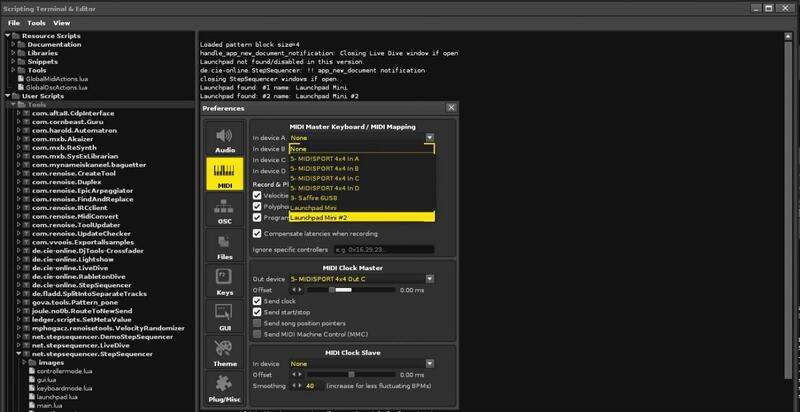 The tools support multiple Launchpads which is working fine in Renoise 3.01 and API 4. When trying to upgrade the tools to Renoise 3.1 and Renoise API 5 the Launchpads do not behave correctly anymore. Selecting a button on one of the Launchpads either does not lit a light or does not send a midi message at all to Renoise. It seems that the midi device names of both Launchpads are the same; The first Launchpad has the name “Launchpad Mini” and the second Launchpad also. In the previous Renoise version 3.01 the first Launchpad has the midi device name “Launchpad Mini”, and the second “Launchpad Mini #2”. In the tools I am distinguishing the midi devices by their name, so I know which device sent a message. And also I am using the device name to determine sending a message to a specified device. The described behaviour above break my tools when using more than one Launchpad unfortunately. Please have a look at the pictures, they show the names of the two Launchpads in the Preferences/Midi/InputDevices menue, and also the printed out device names in the lua console. Maintenance update, bug fixes, 3.2? Or is it possible to change a device name for a midi device? Hm, I tried creating some virtual MIDI ports using the same naming convention. And they turn up just fine in Renoise as separately named devices. Also, I used to have two Launchpads, but I gave one away. So, not able to test with actual hardware.